It creates an internally focused athlete who is hyper-concerned with the PROCESS of his movement rather than the RESULT. This works against the natural flow of human motor learning. It often interferes with the learning and impedes performance. At The Florida Baseball Ranch we take a different approach. We start with the goal and work our way back to allow the athlete’s body to self-organize as it attempts to accomplish the desired outcome. We recently launched The Battery Power Hitting System – the application of our highly successful throwing training process to the hitting universe. We knew that if you hit a ball with a 95+ mph exit velocity and achieve a 15 -32 degree launch angle you’ll end up with a double or a homerun nearly every time. We built a massive Knowledge of Results arena called The Battery. It’s a regulation-sized infield with 15 feet of outfield grass. It has 40 ft. high net walls and a net roof. It’s literally a giant caged infield. We also have about sixteen 10’ x 10’ screens. During “crush practice,” we take 6 of those screens and build a mammoth wall located 25 ft. from home plate. Then we set up our L-screen at 30-40 ft. from the hitter and fire away. According to our triangle calculator, if the hitter gets the ball above the screens and below the roof, he has achieved a launch angle of 15-36 degrees (accounting for the net sag). As our hitters externally focus on the goal of hitting the ball into the visual window created between the screens and the roof, their bodies organize themselves into a swing built to accomplish that launch angle. To make it even more externally focused, and to infuse it with motivation and intention, we borrowed an idea from our friends a The Tampa Bay Rays. We hung a 10′ x 30′ banner on the back net in left center and right centerfield. It’s 20′ from the ground and 10′ from the roof. Hitters who “hit the bull” win a steak! It’s motivation, intention, external focus and objective knowledge of results at it’s finest. And the best part is, we don’t have to say a thing. The environment provides all the immediate feedback necessary to elicit a change in the athlete’s movement pattern. In motor learning science, researchers divide feedback into 2 major categories: Knowledge of Performance (KP) and Knowledge of Results (KR). Feedback is further sub-divided into: Intrinsic (information the learner receives from executing the movement) and Augmented (information from coach’s instruction, video, etc…). KP is generally subjective. It makes value judgments as to the quality of the movement. KP might include common words of encouragement like, “Good job.” Or, “Nice pitch.” Augmented KP says things like, “You had your elbow above you shoulder” “You need to bend your back knee more to use your legs.” Or, “You’re flying open because you’re pulling with your glove.” It might also include video review in which the coach points out mechanical flaws, etc… KP talks a lot about what the movement looks like. In essence, the learning system is not interested in the process of the movement (how it was performed), but rather it leans toward learning and adapting to achieve the desired result. 4) and in the game… dudes with bats in their hands going back to the dugout. If you’re within the parameters of safety, you could be standing on your head and throwing with your knee, and as long as those 4 outcomes are positive, you’re fine. As previously discussed, the motor learning system works best when we follow its natural flow – when we start with the goal or the outcome and work backwards, letting the athlete’s body organize itself. Because of this, KR is superior to KP in accelerating the rate of learning and in increasing the likelihood that the learning will transfer to performance in games – especially where there are time constraints to the movement or the performer is under psychological stress. Does that mean that coaches should completely shut their mouths and never provide KP, opting to let the objective data completely guide the player’s development? No. There is a place for verbal encouragement and augmented KP, however from my personal observation of many coaches, the amount of KP given as compared to KR, is vastly out of balance. On the other hand, overuse or misapplication of KR can present complications too. One problem you might observe in relying exclusively on KR to drive self-organization is that athletes learning a novel skill might not immediately find the most efficient or the safest path to the goal. Remember, the Bernstein Principle states, “the body will organize itself in accordance with the overall goal of the activity.” It doesn’t say it will always find the “best” or the “safest” way to accomplish the goal. This is where the coach comes in. The coach’s most important role is to ensure the athlete’s movements are within the boundaries of safety. After that, coaches/instructors who recognize efficient movement can use motor learning precepts to guide the athlete toward discovery of more appropriate patterns. This does not mean the coach should insist on perfect execution of movement during the practice– a common mistake on the field, in the bullpen, in the gym and in physical therapy practices across the globe. Far too often, as athletes, students, or patients experiment with inefficient, yet safe movements, coaches, instructors, and therapists immediately intervene with augmented KP, eliminating substitution patterns with an iron fist. In an effort to consciously please the teacher, the student forces unnatural compliance and the movement loses its flow or freedom. The only reason one might need to intervene with movement experimentation verbally – in the gym, on the field, or in the clinic — would be to stop an unsafe attempt. Insisting on rigid compliance with regard to form and technique, which we see frequently in strengthening and rehab exercises can be kinesthetically paralytic. It works against the natural grain of motor learning and ignores the coordinative demand of sport-specific movement. Remember, the purpose of any exercise or drill must be to make the athlete play better… period. As stated by Dr. Bosch, strengthening is really coordination training with resistance.” I would submit that in the gym, in the clinic, or on the field, if the exercise demands “perfect” technique or motor control to ensure safety, the load is too much for the athlete to handle. In part 2 of this article (to be published sometime later this week), we’ll discuss the 5 primary methods we use in training to influence movement pattern development and we’ll lay out the implications and application strategies of each. Stay tuned… It will be released in a few days. Meanwhile, we still have a few opening for our 2017 Ultimate Summer Training Program. If you are looking to log hundreds of live at bats against elite level pitchers, The Battery is the place to be. If you’re looking to pack on a few mph this summer, we got you! And if you’re having pain, this is a no brainer. You must get here this summer and let us help you solve your pain forever! Give us a call at 866-STRIKE3 (866-787-4533) and we’ll tell you all about it. Can’t make it for 2 weeks in the summer? 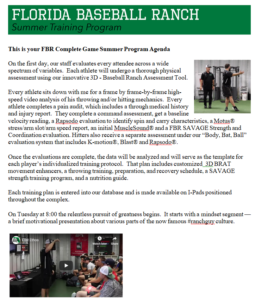 Consider a Weekend Elite Performers Boot Camp, or a one day Precision Strike Evaluation and Training Session.